You have to be self-centered in order to conduct a job search. Only you understand your particular needs, abilities and aspirations. Only you can know the intricate details of your own situation, such as how happy and secure you are you in your current position or the impact of your current unemployment; as well as how important it is for you to you to get a job and how much pressure you are under to do so. Those who educated and mentored you, in order for you to gain the knowledge, skills and experience that brought you to your current level of professional development. Associates, co-workers and mentors who have fostered your professional development to its current state. Professional colleagues in organizations you're a part of, who help you think out your career options and introduce you to people who have the ability to further your job hunt. Friends who helped review your résumé, suggest target companies and positions and otherwise support your efforts. Your spouse, partner or significant other and other family members who support you day in and day out to bolster your ego, help you practice your elevator speech, prepare for interviews and so on. And then there are the people in all the companies to which you apply who give consideration to your candidacy. Chances are, when you apply to a company, you won't even have your résumé appear on a hiring manager's desk until it has been helped along by the human resources personnel who review it and conduct an initial phone screen interview with you. Just like it takes that proverbial village to raise a child, it takes the combined efforts of many to foster any person's professional progression in general. It also takes a group effort to gain traction for a position in any given specific company. It is important that you remain in close contact with your network of family, friends and colleagues. And in order to keep them motivated to help you, an appropriate "thank you" along the way is well worth the small effort it takes. When you do get to the interview stage, remember that it is important to personally and individually acknowledge every person with whom you knowingly interact. The phone screener, receptionist and HR personnel will all be impressed with your gratitude if it's well articulated and sincere – and they will likely will pass on their impressions to the ultimate decision-makers. The current norm is for candidates to send at least a thank-you email the day of their interview or (at latest) 24 hours after it ends. Those who take the time and trouble to follow up with a handwritten note the next day, via snail mail, become true standouts! 1. Be specific. Explain what a person has done and how they did it to benefit you. Not: "Thanks for everything you did for me." Instead: "Thanks so much for taking the time to meet with me and learn more about my accomplishments and goals." 2. Be sincere. If you have to Google "how to be sincere," you likely have more problems than just getting a job! Don't just use standard formulaic language to express yourself. Talk about why you are appreciative and what that person's efforts and actions mean for you, without being melodramatic or too sappy. 3. Be enthusiastic. But don't confuse enthusiasm with desperation. If you say "I want you to know how much I really, really, really want this job," you project desperation. By contrast, you can say, "I really enjoyed our discussion of the XYZ project and have already been thinking about how great it would to be on that team and ways I can help move the work forward by doing A, B and C."
4. Provide follow-up information. Interviews often leave certain things up in the air. Perhaps there is a name of a person someone referenced or some other fact that needed further clarification. A thank-you note can be very powerful when you include helpful information in it. It shows you were paying attention and that you are the kind of person who takes initiative even when it isn't absolutely required. 5. Take back an error. 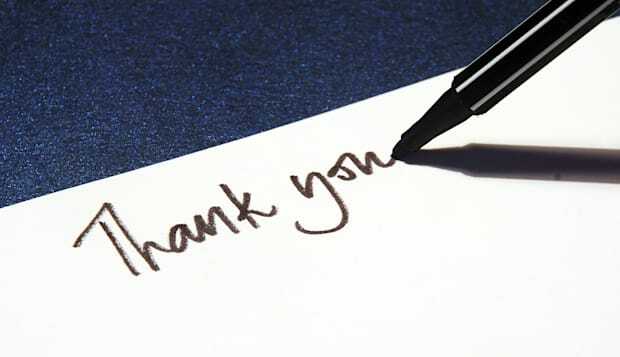 If you made a misstatement or know you were weak dealing with a question, use the thank-you note to revisit the issue. Who hasn't exclaimed to him- or herself, "I should have said such-and-such"? If the error was bad enough to diminish your chances of getting the job, you might just pull a rabbit out of a hat, if you can show that you really did understand something or have something of worth to contribute with a thank-you note clarification.